Begin at start position. with Ball Dribble through tee pee cones then pass to finish position proceed through poles once through collect ball and dribble with ball passing through hoops. once at red cone then turn and pass back.complete the ladders first linear then to the left then back though right. double hop/jumps over hurdles. 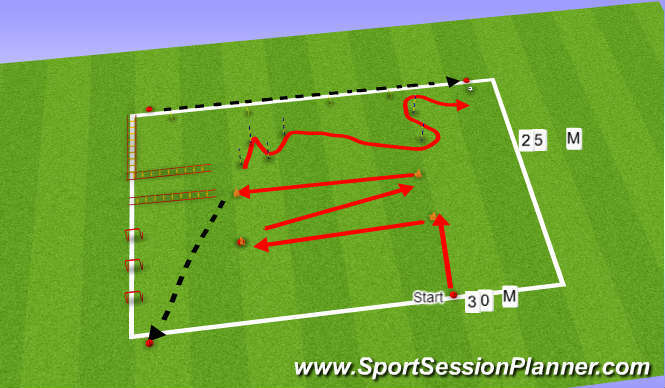 player then sprints around cone and back to start position. player then collects another ball and continues as before. also record last set and compare for fatigue index. 6. 2 mins work. workout ends.